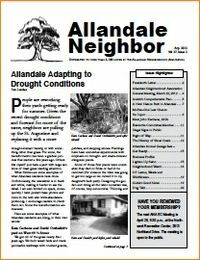 The April 2012 issue of the Allandale Neighbor should be arriving in your mailbox today or tomorrow. That's right. We are using the US Post Office Every Door Direct Mail service to deliver the newsletter as opposed to having a delivery person drop it on your doorstep. Every Door Direct Mail Service should provide us better coverage and more timely delivery. It will also save the neighborhood association a little money. As always, please notify me if you do not receive your newsletter: allandaleneighbor [Email address: allandaleneighbor #AT# gmail.com - replace #AT# with @ ]. Many thanks to the writers and volunteers who helped with this issue. Allandale is fortunate to have so many talented volunteers willing to put in the time to help with the newsletter and make it one of the best in the city. That said, the newsletter is printed in black and white and we are limited on space. One of the stories in the April issue is a show-and-tell on how some Allandalites have modified their yard to adjust to drought conditions. The photos in the newsletter are small and not very sharp so I have provided an online version of the article to give you a better look at the yards. I encourage you to take a look. It may inspire you. Click here to view. As always, there is a lot of good information about our neighborhood in the newsletter and in this issue we include an interesting history on Shoal Creek. One of our long-time residents, who wishes to remain anonymous, emailed it to me. She found it at the Austin History Center about 20 years ago and keyed it in from a type-written document. The History was written by Leila Downs Clark in 1954. It was too long to fit the entire history in the newsletter so I have added it to the website. Click here to read the full version. One final note, support our advertisers. Many of them are from around here and many of them have included some great offers in their ads in the newsletter. Click here for the electronic version of the April issue. If you have story ideas or want to write for the newsletter, contact me.